Dorie Greenspan has a new cookbook out October 24 called Everyday Dorie, and as with all of Greenspan’s titles, it’s wonderful. Read The Takeout’s conversation with the cookbook legend here, and below, a recipe excerpt from Greenspan’s book. Take a peek in my fridge, and you’ll find the usual staples—milk, butter, eggs and yogurt, and my favorite plus-one: “ricotta spoonable.” I started making it years ago and I’ve probably never made it the same way twice. It’s a mix of ricotta, lots of chopped herbs, freshly grated lemon zest, olive oil and plenty of salt and pepper. It’s simple but special. I prepare this year-round, changing the herbs according to what I have at hand, but I make it most often in summer, when I’m apt to fill the table with small plates of good stuff, things that don’t need to be eaten in any order and that lend themselves to mixing and matching. Put the spoonable into the mix, and it will match with beet salad, frittata, onion galette, charred peppers and so many other dishes. If there’s liquid in the container, it’s best to drain the cheese. Line a strainer with a double thickness of damp cheesecloth, place it over a bowl, spoon in the ricotta, pull the cheesecloth around the cheese and weight it with a plate or a can of something. Put it in the refrigerator and let it drain for at least 30 minutes, or up to one day. Alternatively, you can make the spoonable, scrape it into a cheesecloth-lined strainer and refrigerate until needed. Do this, and when you turn out the ricotta, the cheesecloth’s mesh pattern will be visible—it’s pretty. Put the ricotta in a medium bowl. Finely grate the zest of the lemon over it, then halve and squeeze the lemon and blend in the juice. Stir in the shallots, scallions, olive oil, salt and a healthy pinch of pepper. Taste for salt and pepper, then stir in the herbs. Cover and chill for at least one hour before adjusting for salt, pepper and lemon juice and serving. A dollop of this on a cracker or sliced baguette makes a good appetizer; more of it on dark bread with roasted tomatoes, charred lemons or sliced cucumbers makes a tartine; and a lot of it stirred into pasta makes a dinner. The spoonable is best the day it is made, but you can keep it for up to two days tightly covered in the refrigerator. Stir well before using. 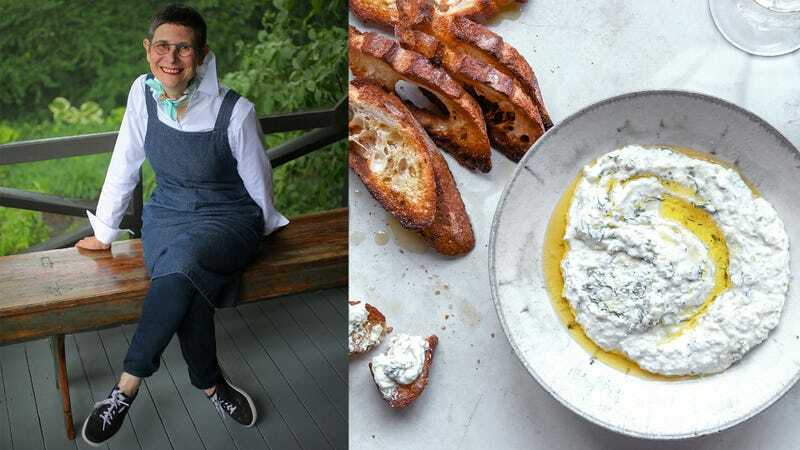 Ricotta Spoonable is excerpted from Everyday Dorie © 2018 by Dorie Greenspan. Photography © 2018 by Ellen Silverstein. Reproduced by permission of Rux Martin Books/Houghton Mifflin Harcourt. All rights reserved.